It's a classic combination... a white shirt with blue jeans. This fabulous white San Francisco Shirt from Cali and York has gold trim buttons and three quarter length sleeves. You can find it here in three colors. The jeans are old from NYDJ. The bag is from Coach. The shoes are from T.J.Maxx. The silver, gold and gunmetal chain necklace is from Chico's. Cali and York is a great new company which offers many beautiful classic pieces. This shirt was a gift from them. Thank you for joining me on this journey through midlife and beyond. The second fifty years are the best! Many of you have asked about my daily routine and what I eat. About three years ago I lost forty pounds. If I stray from the routine outlined below, I immediately start to see the weight creep back on. A long walk everyday is a very important part of my physical and mental health. The earlier the better! I normally walk/run/jog three miles at about six o'clock every morning in the warmer months. In the colder months I walk at the warmest part of the day. I move around as much as possible during the day and never take the parking place closest to my destination. That's it for exercise. I often make a green smoothie using frozen peas, kale (Russian Kale shown here is my favorite), a banana, yeast flakes (for B12), almond milk, yogurt, and a teaspoon of some flavor of All Fruit by Polaner for sweetness. I use this plain yogurt as if it were mayonnaise, sour cream or ice cream depending upon what I am adding it to. I have half of the smoothie with breakfast and the other half at lunch. I just put the blender in the fridge until lunch and then give it another whirl on the blender base to mix it again. I have some version of this hot cereal every morning with whatever fruit is in season. The recipe is here. I sometimes crave a bite of dark chocolate so I will have one truffle occasionally. Dates with yogurt is one of my favorite deserts! Lunch is normally more kale cut up in small ribbons (julienned) with whatever vegetables I have in the fridge. Heirloom tomatoes from my parent's garden are the centerpiece of every lunch right now. I eat vegetables raw whenever possible. Purple Japanese sweet potatoes or quinoa are often part of my lunch. Here is another version of lunch. A little olive oil and balsamic vinegar are the only condiments I add to salads. Fresh herbs and garlic also give some added flavor. Eating whatever is in season and local as often as possible is my goal. I also buy organic if it is available. I may on rare occasions eat a piece of chicken or fish if I am at a restaurant I know serves free range or wild caught. Lunch is eaten at about two in the afternoon. I try to eat nothing after three in the afternoon. If it is date night or there is some other social occasion in the evening I will order a salad and a glass of wine. I am mindful of portions at all meals but I eat the least amount of food possible in the evenings. Food is nourishment not entertainment, not therapy, not reward. If I eat high nutrient foods during the earlier part of the day, I rarely feel hungry in the evening. I sleep much better when I go to bed with an empty stomach. I also feel less hungry the whole next day. I adore this great Rancho Mirage tunic I received from Cali and York. The tunic comes in three colors! I am wearing the tunic over a plain white tank and old Levis. The DVF shoes are old and they are from Nordstrom. The Alberta di Canio handbag is from T.J.Maxx. You can find many more high-quality classic pieces like this tunic at Cali and York. Thank you for joining me on this splendid journey through midlife and beyond. The second fifty years are the best! Thank goodness for the weekend and a break from all the to do lists! Mr. Mickey and I enjoy Asheville, North Carolina for the wide variety of events that are always happening, international dining adventures, shopping, art galleries and the general festive atmosphere which seems to prevail on summer weekends. Up there where the red umbrellas are is the Sky Bar. We will visit there later to watch the sun slip behind the distant mountain ranges. In midsummer the flowers in planters throughout the city are simply breathtaking! This street performer absolutely defies gravity. These fellows found a shady entry from which to serenade the passing tourists. As we walked past, they sang "I like your shoes." We will never know if they meant mine or Mr. Mickey's. Wall Street has many unique shops and restaurants. It remains one of our favorites. From a crochet covered tricycle to the famous Spoon Lady, you never know what you might find around the next corner. We were captivated by the haunting sound of this performer's electronic "violin". We listened for a long while and even bought a CD from him. His twin brother performs on the same type of instrument in Greenville, South Carolina. The handsome brothers are Stephen Neil and Jeff Neil. I have been meaning to visit the Southern Highlands Craft Gallery in the old Biltmore Oteen Bank building for months. It was great to see all the works of art there. The building has been beautifully restored. New to the Biltmore Village is the Well Bred Bakery of Weaverville. We stopped there to look for a loaf of bread for Mr. Mickey. The weather was very warm but it was a beautiful day to be in the city. Mr. Mickey is a happy man! As the sun starts to slide down toward the horizon, we make our way to the Sky Bar. We shared a table with the most delightful beautiful young couple ever! This is Drew and Blaine. We fell in love with them. It was instant best friends! I felt so sad when it was time for us to leave for our drive home. Watching the sun slip behind the mountains marked the end of a perfect day. My top is from Chico's. The white jeans are from Kut from the Kloth at Dillard's. The shoes are from T.J.Maxx. The bracelet is old from a gallery in Highlands, North Carolina. Thank you for joining us on this splendid journey through midlife and beyond. The second fifty years are the best! The challenge of finding fashionable great fitting clothing for the way we live today is often a chore. I was recently introduced to a great new company which offers fabulous clothing in classic elegant styles. Cali and York was created by like-minded merchants with years of experience and the desire to provide something better. Cali and York roots itself in the belief that quality, style, fit and customer service are the foundation for success. With these shared beliefs, the vision turned in to reality with the launch of Cali and York earlier in 2014. They design with you in mind, taking pride in every detail of their collections by selecting fabrics, trims and colors that suit your fashion lifestyle. Their standards of excellence will ensure your total satisfaction. This elegant top was a gift from Cali and York. Three quarter length sleeves and a boat neck are so flattering in this casual top. The length is perfect to wear with straight leg jeans. I love that the knit is a heavier gauge so that every bump and mark of time is not on view to the world. I am very impressed with the quality and timeless design of all the items I have received. Find your fashion lifestyle at Cali and York. They have so generously offered to also give this beautiful tunic away to one of my randomly chosen followers! #1 To enter, become a follower of this blog and then include your contact email in the comments below or on the Facebook post announcing this giveaway. #2 The winner will be randomly selected and will be announced on Sunday, August 3rd. On some date nights we have a progressive dinner, roaming from one restaurant to another. For the first course we may have a glass of wine and an appetizer in one restaurant. At another restaurant we may have a salad. Our first course for this evening was enjoyed at Cafe' Lola. This is a great place to meet with friends and have a cocktail after work and then come back later in the evening for an elegant date night. Our next visit was to the bar at our old favorite, Wellington's in the Carnegie Hotel. Sometimes we sit by a fireplace or a window with a great view and have a glass of wine and a long conversation. Those conversations often draw in other people sitting around us. On this evening we met a delightful group of women celebrating one young woman's start of med school here at ETSU. These two beautiful ladies are the mothers of the lovely young women below. We visited with this delightful group for a long pleasant conversation. It was great to share in the celebration of the exciting life adventure that they are just beginning. Our last stop of the evening was on the patio at our favorite place to visit in town. 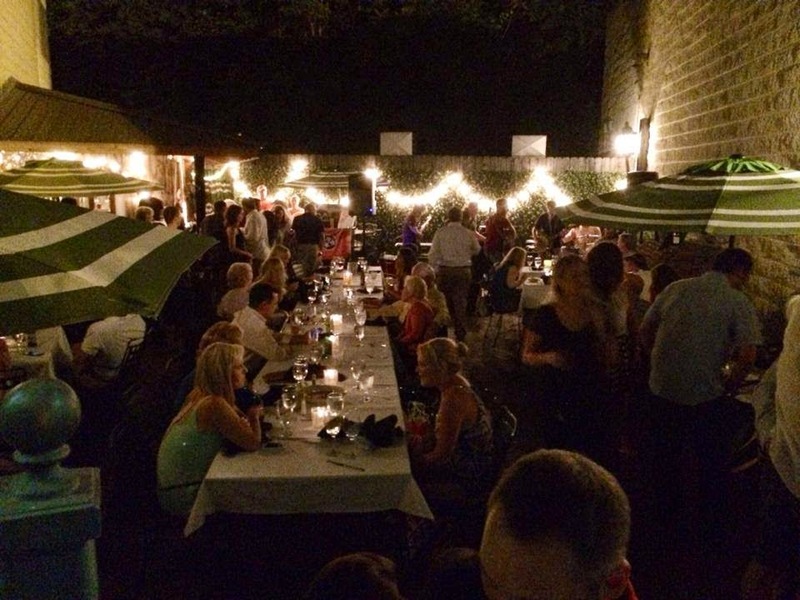 Gourmet and Company is celebrating twenty-five years in business and so on the 25th of each month this year there is a special dinner menu along with live entertainment on the patio. Tonight's performance was by the great local band, This Mountain. The festive evening ended visiting with great friends and listening to superb live music. The Cynthia Rowley shoes are from Belk and the little black dress is by Ralph Lauren via T.J.Maxx. The asymmetric neckline and ruching at the waist are details that make it unique. I am most definitely more comfortable in pants and a jacket but there are occasions when one needs a dress. I am glad I found this one last week. And now for a little Wear It Wednesday... In an earlier post many of you hated my cool lace up black shoes with this jacket and a pencil skirt, so I restyled it for you here as requested. I still love the shoes but I will wear them with straight leg pants in the future. The skirt is in the to go bag. Thank you for joining Mr. Mickey and me on this fun journey through midlife and beyond.